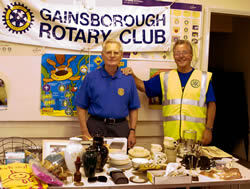 On Saturday 21st July the Rotary Club of Gainsborough held a Family Fun Day at the Village Hall in Beckingham. Despite the recent heavy rain and ominous forecast the committee decided on the morning of the 21st to go ahead but to move many of the stalls inside and to cancel a few of the outside events originally planned. The Rotary's main charities that they were supporting on the day were the Anthony Nolan Trust and Five Villages First Responders. In addition other charities that took part in the fund raising were survival kit organisation Shelter Box, Wheelchair Foundation and Freeplay Foundation which provides radio to those living in poverty. Another charity that was looking for support was Freedom Trail, charity marking the 200th anniversary of the abolition of slavery. Freedom Trail is currently raising money for a number of four wheel drive vehicles which will be used to help rescue child slaves being held in the Gold Mining Industry in Sierra Leone. Outside there were a number of vehicle displays including a rally prepared Metro car, classic cars and wonderful old tractors. 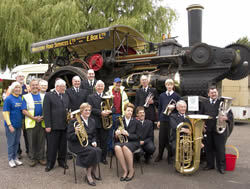 A magnificent Steam Engine was on show and an extraordinary Showman's Living Van that drew especial interest. 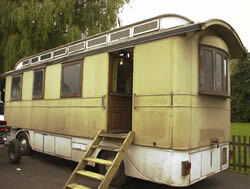 This van had some superb original fixtures and fittings and included a small bath 'under the floor'. Last but not least was an old 1940's single decker bus that was giving 'bus rides' round the village and for those of a certain age probably brought back fond memories! The Salvation Army played a number of tunes throughout the day and inside the village hall there was musical entertainment by The Stormbeats and a dazzling display by Ann Hargreaves Dance Group. Despite the disappointing weather there was a fair attendance and those that braved the weather (which on the whole was not too bad) enjoyed the efforts of those that had helped to organise the day. 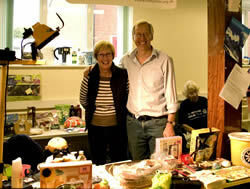 More than £300 was raised with additional donations pledged by the Rotary for its two main charities.